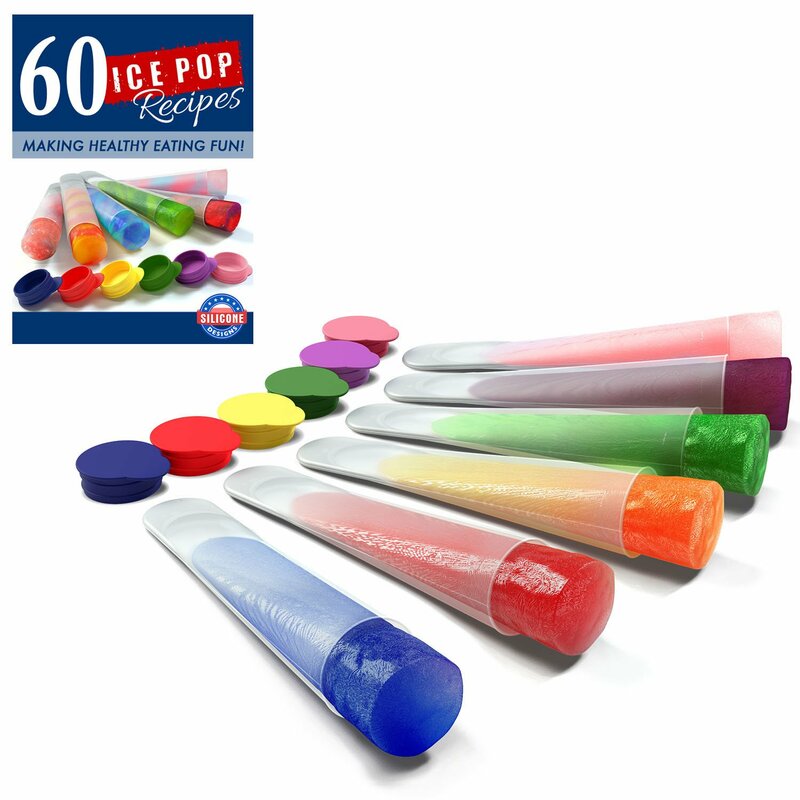 Home › Home and Kitchen › Silicone Ice Pop Molds And Ice Pop Maker Set Of 6 Clear Tubes Plus 60 Recipes..
Silicone Ice Pop Molds And Ice Pop Maker Set Of 6 Clear Tubes Plus 60 Recipes..
TOP 20 IDEA FOR SUMMER FUN. FREE LIFETIME WARRANTY, 60 Free Ice Pop Recipes eBook and Healthy Eating Guide Ebook sent by email after product ships. 100% Customer Satisfaction Guarantee!! 100% PURE GRADE SILICONE - exceeds FDA and LFGB (European) silicone standards. BPA Free. No Latex. Passes the Ultimate Filler Test for Silicone - the Burn Test! EASY TO USE. Making healthy ice Pops is as easy as adding fruit, ice and yogurt into a blender and puree. Pour - Freeze - Eat - Repeat! SAFE FOR YOUR FAMILY. Healthy snacks for your kids. No more GMOs, high fructose corn syrup and other additives. Dishwasher Safe. Silicone Ice Pops For Eating Healthy Snacks and Improve Your Kids EatingHabits Now! - Are you tired of feeding your kids GMOs, High Fructose CornSyrup and other chemicals? - Do you want to add healthy vegetables to yourkids diet, but they won't eat them? - Do you want to expand the number offruits and vegetables your kids eat? Introducing an Easy Way to Add HealthyFruits and Vegetables to Your Kids Diet! - Designed with safety in mind - BPAFree. Latex Free. Exceeds FDA standards on food safety. - Environment Friendly- no throw way sticks or other paper - Eat to Make - blend, pour, freeze, eatand repeat! - Easy to clean. Dishwasher safe. - Easy to Use. Kid-friendly pushdesign keeps juice inside and not on their clothes! - Extra Red and Green Topsfor Christmas Take Charge of Your Family's Health and Avoid the Chemicals inGrocery Store Snack Foods: - Avoid high fructose corn syrup, GMOs, artificialflavors - Avoid preservatives, food dyes, MSG - Avoid food allergy ingredientslike milk, eggs, nuts, wheat Enjoy Watching Your Kids Having Fun AND EatingHealthy - Use healthy fruits and vegetables - Sneak in some spinach leaves -Add honey, applesauce, yogurt or ice Extra Bonuses - Amazon Buyers TrustSilicone Designs with their Free Lifetime Warranty - Free 60 Ice Pop RecipeeBook sent by email - Money back guarantee and free replacement guaranteeDon't Wait! Start Eating Healthy Now! We Cannot Guarantee this SpecialPricing, So Be Sure to Click Buy Now!